We as Christians are called to be soldiers, God equips us with what we need for battle according to Ephesians and Why we need the Whole Armour of God. We are not fighting in a physical battle of flesh and blood but in a spiritual battle against the powers of darkness, which is the devil and his angels. It is imperative that we have the whole armour and not just pieces of it so we don't leave ourselves venerable for the enemy to attack us. We need to be Spartans For Christ!!! Preparation for war began very early in life for a Spartan boy. Upon birth elders inspected him and if judged unfit he was left to die. The child that survived this first test was then taken from his mother at the age of six and organized into companies where physical exercise, dancing and some reading and writing were undertaken. At eighteen Spartan boys were assigned to messes and spent their time hunting and practicing the martial arts. Though repugnant in modern eyes this callous system of training did produce well disciplined troops who fought as a team and who could withstand the hardships of an arduous campaign. The Spartans had the reputation of fielding the best hoplites in Greece during the Classical period. 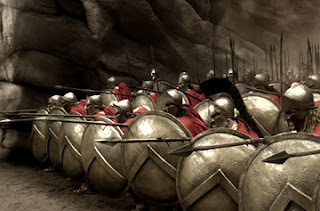 The Spartan hoplite was armed with a spear, shield and helmet and fought in close formation known as a phalanx. Each man depended on his neighbour whose shield helped partially to protect him when the hoplites stood shoulder to shoulder. Moreover, the Spartans organized themselves into platoons of men of similar age who were assigned different tasks in battle. We need to do as Spartans did in battle and prepare, train, and work together as a team to use the spiritual weapons God has given us to defeat Satan's empire.